BANGI, 2 Aug 2012 – The lack of clear and precise definition of terrorism, which to some are freedom fighters has caused many human rights violations. 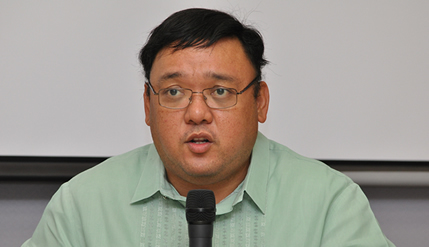 A Law Prof from the University of Philippines College of Law, Prof Harry Roque who has been involved with victims of the Maguindanao Massacre and Filipino ‘comfort women’ said depending on which side of the fence you are on, one country’s terrorist is another’s freedom fighter. “The apparent contradiction or lack of consistencies in the use of the term terrorism can be demonstrated by historical facts that leaders of liberation movement such as Nelson Mandela in South Africa and Habib Bourgouiba in Tunisia who were originally labelled terrorists by those who controlled the territory at a particular time but later become internationally respected statesman,” said Prof Roque. He was giving a public lecture on current challenges that is facing International Humanitarian law here recently. The lecture was organised by The National University of Malaysia (UKM) in collaboration with the International Committee of The Red Cross (ICRC). He represented victims of Maguindanao Massacre and actively involved in seeking repatriation for cases of ‘comfort women’, where women in Philippines were forced by the Japanese military into sexual slavery during the Second World War. Prof Roque said there is no clear and precise definition of terrorism and that had led to many human rights violation at both the international and national levels. He gave the example of the Palestinian Liberation Army of the PLO which is considered a terrorist group by Israel but a liberation movement for Arabs and Muslims just like the Kashmiri Resistance groups who are terrorists to India but freedom fighters to Pakistan. A drastic example would be the Afghani Mujaheeden (later to become the Taliban movement). They were freedom fighters during the cold war period and nurtured by the United States, but a terrorist gang for the Soviet Union. The perception of whether a group is a terrorist or a freedom fighter is a result of opposing political interests that cannot be reconciled. The lack of a definite definition has also led to abuse of due process where a person is deemed innocent until proven guilty. Prof Roque gave gave the example of the Philippines where the lack of a clear definition of a terrorist gave President Gloria Macapagal Arroyo the sole discretion to determine what acts constitute terrorism under her Government Order no 5. That had enabled indiscriminate arrest without warrants, breaking into offices and residences, taking over media enterprises, prohibition and dispersal of all assemblies and gatherings. That portion of the GO no 5 pertaining to terrorism was later declared as unconstitutional. Though there is no clear definition of who is a terrorist, those who are deemed terrorists have been subjected to enhanced interrogation techniques by the United States. One of the techniques is the notorious “water boarding” interrogation method where the prisoner is bound to an inclined board, feet raised with cellophane tape wrapped over the prisoner’s face and water poured over him, leading to a terrifying fear of drowning, he said. Another problem that arise was that anyone who tries to advocate the rights of these prisoners who are labelled terrorists will also be punished. He quoted David Cole, an American counsel commenting on a decision of the American Supreme court decision in the Holder vs Humanitarian Project, a case about counter terrorism measures saying: “According to today’s Supreme Court decision, advocating for human rights and peace can be prosecuted as a “terrorist” crime, punishable by 15 years in prison. The situation against those who are deemed terrorist by the United States, do not stop at government sanctioned torture but even include targeted killings referring to Anwar Al-Awlaki, an American citizen in Yemen killed by American drone attacks. When, if ever, it is lawful for a state to conduct targeted killings? he asked. Even in fighting terrorism there is a need to respect human rights. Dean of the Law Faculty, Prof Dr. Aishah Bidin, students and lecturers attended the lecture.